Skip to content. Skip to main navigation . Skip to additional navigation. Skip to Sitemap. Responsibilities: The PD is directly responsible for oversight of the Indiana AgrAbility Project (the Project) , including management of Purdue personnel involved, fiscal management, reporting, accountability issues, and liaison activities with funded affiliates and USDA-NIFA Project officer. He will review all resources prior to release and participate in training/networking activities. He will chair the Indiana AgrAbility Project Advisory Team and ensure that strategic planning findings are incorporated into annual project renewal plans. Qualifications: Professor Field established the BNG Resource Center in 1979 and has provided leadership to it for the past 29 years. He has been involved in all aspects of BNG's programming, including the development of resources, conducting research, designing adaptive aids, and providing on-site services to farm and ranch families dealing with disabling conditions. Over the past two decades, Dr. Field has managed millions of dollars in grants, contracts, and gifts relating to rural disability issues. These include grants from Deere and Company, NIDRR, RSA, USDA-CSREES, CDC, Indiana Department of Vocational Rehabilitation, and NEC Foundation of America. He has participated in rural disability-related events in most U.S. states, four Canadian provinces, and several foreign countries. Responsibilities: The Project Manager will be responsible for day-to-day management of operations and Purdue staff and for project coordination with the staffs of the subcontractors and unfunded collaborators. She will coordinate annual reporting activities of the Project and other initiatives, such as Advisory Team Meetings. Qualifications: Cindy Chastain serves as both Project Manager and Veteran Outreach Coordinator, and she has a strong background in both the military	and agriculture. She grew up on a family farm in Indiana and later earned a bachelors degree in animal sciences from Purdue, where she participated in ROTC. Cindy then served as an Army officer for more than 31 years, including service as Deputy Commander of the 1-19th Agribusiness Development	Team from 2008-2010, which was deployed to Afghanistan in 2009-2010. She	continues to function as president of Chastain Farms in Crawfordsville, IN. Responsibilities: The Rural Rehabilitation Specialist conducts disability and accessibility assessments of farms, homes, and businesses, and develops reports related to such assessments. He assists potential entrepreneurs interested in self-employment through business planning services. He is the primary liaison with Indiana Vocational Rehabilitation Services, and he responds to information requests via the toll-free helpline and other means. 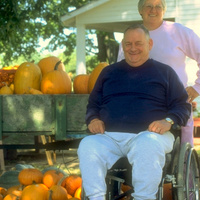 Qualifications: Mr. Swain joined the Breaking New Ground Outreach Program as the Rural Rehabilitation Specialist in August 2000 and the Purdue University Extension New Ventures Team in January 2004 He is a member of RESNA, a RESNA-certified Assistive Technology Practitioner, and has worked directly with Indiana Vocational Rehabilitation Services to develop self-employment business plans for farmers exploring alternative sources of income. Responsibilities: The Education and Resource Specialist coordinates media-related activities, including production of the News Note newsletter and updating of the project website. He assists with outreach activities, such as the Bridging Horizons Community Service Contest and in-service training to rehabilitation-related groups. Qualifications: Paul Jones has been an AgrAbility staff member since 1998 and manager of the BNG Resource Center since 2000. As manager of the Resource Center, he has been involved in the development of all resources, including several that have received national awards. He recently managed a grant from NEC Foundation of America that allowed for the distribution of assistive technology resources to every county Extension office in the U.S. Responsibilities: The Veteran Outreach Assistant (VAC) works with various veteran and agricultural agencies to ensure that veterans gain access to the resources that AgrAbility can offer. She collaborates closely with the NAP Veteran Outreach Coordinator and the Assistive Technology Specialist. The VAC also works on special projects, scheduling and logistics for events, and is an integral part of the Indiana Beginning Farmer project. Qualifications: Katherine Prasuhn has worked with the Breaking New Ground Resource Center for two years. Her background is in agricultural education with an emphasis in horticulture. Before joining AgrAbility, she worked in the agricultural industry and for the CenUSA project. Responsibilities: The Project Assistant helps with outreach activities, preparing reports and applications, shipping and invoicing, and variety of other tasks. Qualifications: Robert Turner began working for the National AgrAbility Program in 2017 on special projects. He has a bachelor’s degree in education from Purdue University and a master’s degree in cross-cultural Christian education from Columbia International University. He worked at an international high school in Taiwan for 18 years as a teacher, boarding supervisor, and school administrator. Robert also works with his family farm in Indiana in the production of corn and soybeans. Responsibilities: The Project Assistant will provide information management services for the project, including report preparation, mailing list maintenance, and data management. Qualifications: Denise Heath has served as the information processing systems operator for the Breaking New Ground Resource Center for more than 25 years. She has carried out numerous responsibilities, including the design of brochures, fliers, pamphlets, newsletters, and other materials; created complex documents, including technical research articles, proposals, and manuals; and served as the main phone operator and receptionist for BNG. Responsibilities: The AgrAbility Coordinator for Hoosier Uplands will focus on outreach and engagement in the southern half of the state. Special emphases will include networking with Extension, Farm Bureau, Area Agencies on Aging, and other organizations, plus educational outreach in rural mental health, caregiving, and youth activities. Qualifications: Linda has been a Program Management Supervisor at Hoosier Uplands since 1990, where she also leads Indiana tobacco prevention and cessation initiatives. In addition, she is active in Farm Bureau and the Indiana an Orange County Cattlemen Associations, and has been a 4-H leader for more than 40 years. Responsibilities: The Farmer Liaison will be available for media interviews, awareness presentations, and marketing opportunities. He is also available for training, education, and support, such as staff training, consumer workshops, trade shows, and other areas where his expertise would be advantageous. Qualifications: Ed Bell has been associated with the Breaking New Ground Resource Center since 1992 as a client and farmer-consultant, Barn Builder Peer Support Network member, and owner/operator of Bell's Strawberry Farm. He is a founder and former executive director of a rural independent living center, a professional public speaker, and a consultant/account executive for The Standing Company. Mr. Bell has conducted professional trainings and presentations on both the state and national levels. Responsibilities: The Vocational Rehabilitation Consultant will serve as a resource for guidance with VR-related issues. He will also help with outreach activities, such as farm shows and conferences. Qualifications: Steve Etheridge is a certified rehabilitation counselor (CRC) with master’s degree in vocational rehabilitation from the University of Wisconsin-Stout. He worked for 40 years in employment and training with	the last 20+ years as a vocational rehabilitation counselor for the state of Indiana. Steve managed a general case load in rural northeast Indiana with a specialty in traumatic brain injury (TBI) and served on the Indiana VR Commission	and the VR TBI Advisory Board in advisory capacities. For more than 10 years, he has been an advisory team member for the Breaking New Ground/Indiana AgrAbility Project. Copyright © 2012 Purdue University, all rights reserved. Purdue University is an equal access/equal opportunity university. If you have trouble accessing this page because of a disability, please contact Clifford Racz at 1-800-825-4264 or through the contact form.